Visiting a hairdresser is an everyday activity with the aim of improving your individual appearance. Getting a haircut is a part of ouer culture. 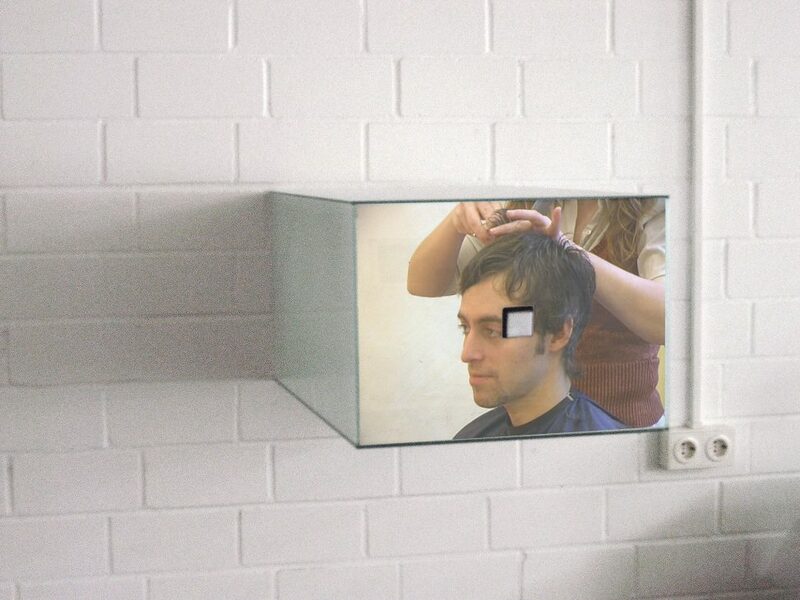 The videos played in “Impulsbild Friseur” (Impulse Image Hairdresser) show me, in the process of having my hair cut, revering to the ritualised process of washing, cutting, blow-drying and styling. Nine years before the word “Selfie” became popular and two years before Youtube established the play button placed in the center of the picture, the sculpture “Impulse Image Hairdresser” investigated the genre of the self-portrait in the context of interactive electronic media. The invitation to interact with the work disrupts the viewing of the video images, as the push-button is mounted in the middle of the screen. The large flashing button is an important part of the video sculpture not only because of its function but also because of its physical presence. The self-portrait is not produced by finding certain images rather through the staging the simple interactive functionality as the central aspect. This shift from paying all the attention on the iconography to paying more and more attention on the interaction unmasks the self-portrait as a big desire for feedback.